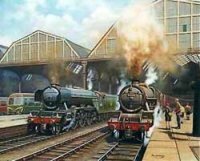 Art posters prints, limited editions and paintings featuring the age of steam railways. 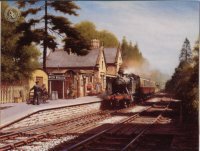 Live again the nostalgia of railways before the "Beeching Axe" with fine steam locomotives and old village railway stations, many of them closed forever. "City of London - Coronation Class"
"Steam in the City "